A trip to Marshalls the other day revealed that Sation polishes are indeed in stock. You may remember a post about that earlier. It's not a complete stock, with only a few polishes here and there, but I couldn't help picking up a beautiful neon pink for just $2.99. Mimicking a shirt I also picked up during that same trip, these stripes were created using Chatty Catty (Sation) and Load (Illamasqua). I love the way the accent nail looks. It's so subtle and difficult to tell there's a party nail in the mix. Haha I agree about that accent nail. I love these colors together too. Very cute!! I love it, but I'm biased, I'm a huge fan of pink. Wow, those colors are beautiful. I like it! 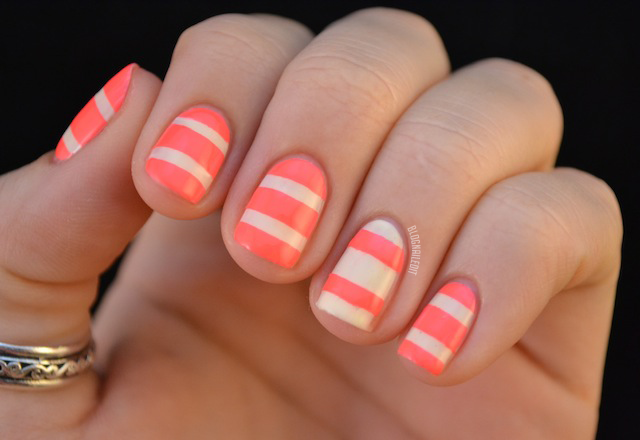 I love this manicure!! The colors are great and I love the subtle accent nail!! Gorgeous! I love those colors. aw haha I love "party nail", that's awesome :) Gorgeous mani, Load is on my wishlist! These colors are great together! So simple, but so pretty!